In its statement last month, mobile manufacturer Nokia, the firm based in Finland, had made an announcement regarding the availability of the new Nokia TV app for mobile devices running on Windows Phone, although conforming only for the users in its hometown. Nokia, the once leader in mobile industry and almost an untouchable force, was gradually eclipsed as the Symbian OS failed to match up to the Apple iOS and Google’s Android. The Finnish outfit, as a result, had to turn back to its old partner Microsoft along with the germinal OS, Windows Phone. Nokia has now put all its effort into the new flagship Nokia Lumia mobile series , and in the process have managed to generate for themselves , a considerable fan following. The sleek designing and remarkable Metro interfacing of the Mango , windows Phone 7.5 , has gotten geeks across the world going crazy over it despite the availability of cheaper and better devices available in the market. Given that the release of Windows 8 is not very far, Nokia Inc. is ramping things up through a series of promotions and now Nokia TV – the television viewing and catching-up services. 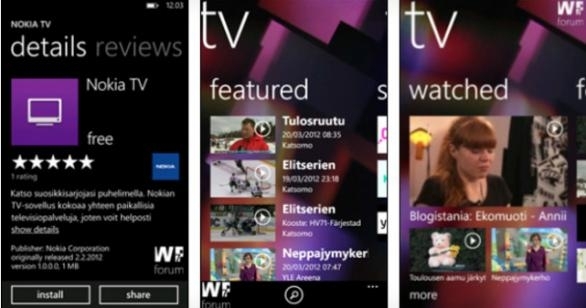 In latest developments, the mobile application will now be available for downloading on Nokia Lumia phones in Finland, which will provide them access to their favorite TV channels directly from mobile devices. Now all that you need to do is to download the application from the portal. Now you don’t have to miss your favorite shows, matches and music shows, although it will be working only for the Finnish audience right now. But they can be installed by users living in any country and used elsewhere. According to the news in the Windows marketplace, the application is capable of letting the users choose from list of TV services locally available at single sites. Not only that, it will also allow searching all the available services at one time, and then selecting the TV shows they would like to see and play them immediately. During the announcement of the new mobile application, Nokia stated that they will be providing support on the existing television models of the broadcasters’. Without signing up or registering, the TV app downloaders will be able to browse and search the catalogues of services provided by the broadcasters. These shows can also be played without registering for them either. In its vein to differentiate itself from other mobile manufacturers, this is an added and exclusive feature by the Finnish firm. Windows phone users currently have apps like Nokia Reading, Nokia Music and navigation on Nokia Maps. They however did not provide information on how soon the Nokia TV will be outside Finland. Given the slated release of a lot of new series in the coming few months, it’s a critical time for Nokia, the new Lumia series and Windows Phones as a whole. No word is still available on when TV streaming will be opened outside, but with the launch of Nokia TV they have gone a step forward in reclaiming their lost identity and market share.